Carved out of a solid block of aluminum, HTC's great white hype is the oft leaked One aka M7. It's what the company is touting as its new flagship device today in New York. 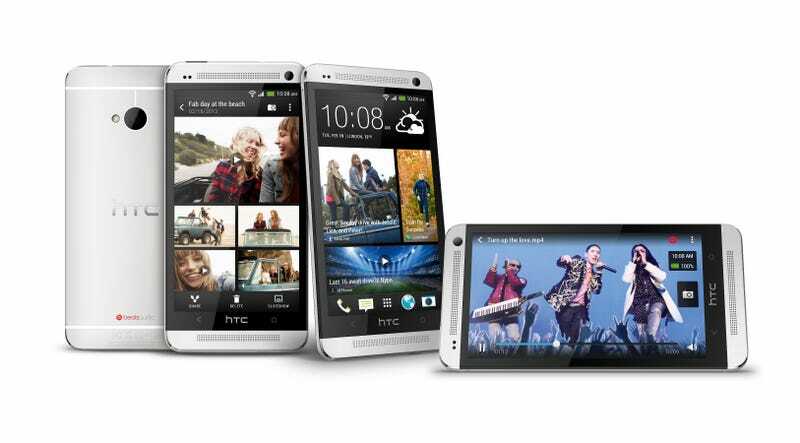 And in typical HTC style, the One has one or two new software features to help differentiate itself from the rest. It has what you'd expect from a brand new smartphone: 1.7GHz quad-core Snapdragon 600 proc, 32 to 64GB of onboard storage, 2GB of RAM, Bluetooth 4.0, NFC, LTE and a 2300mAh battery. The screen is a whopping 4.7 inches with a 468ppi 1080p display. But all of that is a snooze when you find out that it's running Android 4.1.2 wrapped in a newer version of HTC's Sense. Luckily the One has some more interesting features in the bag. Like the Nexus One before it, the One is shaved out of a solid block of aluminum and I'm told it takes roughly 200 minutes to carve out each unibody casing. It looks quite hefty, like Lumia 920, but is surprisingly light and cold to the touch, which I liked. It weighs 143 grams and the tapered backside made it easier to handle, too. Unlike some of HTC's previous phones, the One feels like a premium device. The most interesting thing about the One is its 4-megapixel camera. Yeah, you read that correctly. Well, according to HTC's marketing folks, it isn't megapixels but UltraPixels with each allowing 300 percent more light. HTC's demos show its larger pixels performing really, really impressively in low light, but we'll reserve judgement until we put it through its paces. In theory, though, HTC is right—megapixels don't really matter. A dedicated ImageChip 2 helps boost the prowess of the f2.0 lens, which claims to simulate a normal 28mm lens. I had a few minutes with the device last week and picture quality seemed to be pretty good but who can really tell when you're looking at images on the device itself. We don't have all the details about how the tech works, but it does seem pretty reminiscent of Sigma's "46 megapixel" sensor, which is really three 15.4MP sensors laid on top of each other—one each for red, green, and blue. Another notable camera feature is Smart Flash, which automatically picks from five different flash settings depending on the distance from the subject. And if HDR is your thing, the One does that too, including video. The most visible new feature, though, is a redesigned homepage for your phone that HTC calls BlinkFeed. Rather than a customized home screen that you'd normally find on an Android device, you have a stream of blips and bites from the web in addition to your local weather and the time. You can opt into a variety of content feeds, including Twitter, sports news from ESPN, world news, tech news and the like. You might like it, you might not. On top of the UltraPixels is another new feature called HTC Zoe and Zoe Share. With Zoe turned on in camera settings, you can shoot a three second video clip (Mpeg) and extract just about any frame you want for that picture perfect Kodak moment. You can also upload and share the clip through Zoe Share, which generates a shareable link that directs folks to an HTML5 page. I can't tell if it's a Vine-like play or what but it's there if you're into that sort of thing. Zoe Highlight is another new feature that compiles and edits together images, Zoe images and videos based on a number of factors, like location, time, date and some image recognition that Zoe does in the background. It does it automatically, since HTC kinda smartly realized that you're not going to do that on your own. What you get is a reel overlaid with some music and a filter effect that HTC hopes you'll share with your friends and family. There are something like six different themes that you can choose from. It's pretty cheesy but I'm sure some folks will like it. On the audio end, BoomSound is a new enhancer that makes the speakers louder and clearer, according to HTC, than previous models. It can also display lyrics while you're playing songs, in real time, for impromptu karaoke that you'll use maybe like once or twice when you first get your phone—but it's still pretty cool. Dual-mic HDR recording built-in allows mics to record relevant audio on the fly. It captures a broader spectrum of sound and evaluates and differentiates the signals. And for the TV buffs, there's HTC Sense TV, which effectively turns the One into a remote for your TV and set-top box. Tucked inside the power button is a tiny IR sensor, which I thought was pretty clever from a design standpoint. Anyway, you can connect to one of 10 different TV/set-top box combinations and browse local listings thanks to Peel. Look for the One to be out late March in 185 different countries. All major carriers in the US but Verizon have said they'll carry the One.